Dizgraceland: Voo do you think you are? I thought about making the title of this post, "Stick it," but thought people might take it the wrong way. I'm not even sure of my point...ha, ha....point...stick it....pins....I get it. No stop. I am killing myself. No wait, I remember my point. Blogger is once again killing me with lost posts and now lost comments. Why do you hate me Blogger? What did I do to you? Don't I hype your parent company, Google every chance I can? Don't I sell your ads on my blog to my massive audience of 10 or so regular readers? Why are you sticking it to me? 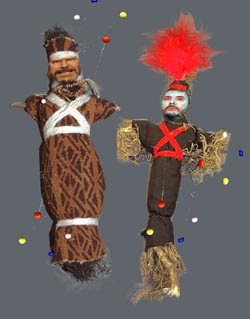 And speaking of Voo Doo dolls, I kind of think they are cool. And since New Orleans is one of my favorite places, I have seen my share of Voo Doo dolls. I even own a few. You can buy them in Voo Doo shops throughout the French Quarter. You can even buy Voo Doo doll refrigerator magnets. Ironically, most of the Voo Doo dolls you can buy in New Orleans were actually made in China. I get a kick out of that. But I shouldn't poke fun at Voo Doo dolls. Anyway, I don't claim to know alot about Voo Doo dolls or Voo Doo. I do think it is funny that god fearing Christian tourists from the Bible belt will waddle through the French Quarter drinking $1.00 beers, stop in a Voo Doo shop and take home a souvenir Voo Doo doll refridgerator magnet or Gris Gris chicken foot key chain for Aunt Mabel. Not that I condone or knock Voo Doo or Voo Doo dolls (or Gris Gris chicken foot key chains for that matter). But I do find it annoying that Blogger can't provide me with the security I so greatly seek out of a blog content management system. Reminds me of the genuine indian artifacts and pottery you can get in Cherokee North Carolina, made in China, of course. So, this is the voodoo that you do so well, huh? If you get the eyes and crotch confused, I think I know why your wife needs to cast spells. You can't blame the Christian tourists. Voodoo dolls are much more versatile than a Christ cake topper. I love me some voodoo dolls! I find them to be very effective--especially my Bill Gates dolls. I noticed your blogger problems the other day. Trust me, you weren't alone. Voodoo dolls, sock dolls. You be the judge. I love voodoo dolls and allowed my son to buy one when we vacationed in the Keys. I'm so thankful that I can once again post comments. When it goes down like that I'm always a bit worried that they will start charging when they get it up and running again. Maintenance fees you might say. I actually find my christ cake topper very useful. I would never pay for Blogger. I'd go back to writing html before I'd pay. I guess it goes back to my "nuthin ain't nuthin but it's free" entry. I think blogger hates everyone it is not just you! Cherish, I think Blogger is just too big.